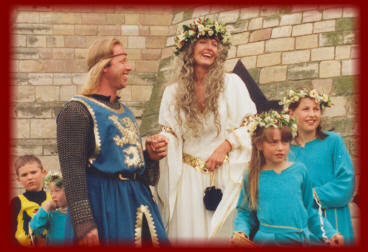 nce upon a time there was a Princess called Valaria. She had always dreamed of meeting her true love. Many years she spent in her tower wondering and waiting for the bravest knight in all the lands to come and save her and take her ashis wife. Many knights had asked of her hand but none were brave enough or handsome enough for her to give her heart. Valaria’s heart skipped a beat and she knew the time had come and she had finally met her true knight in shining armour. All those years of waiting and believing were finally ended. She ran down the stairs of her tower to stand before the man she would spend the rest of her life with. They kissed a kiss that was to last a lifetime...The Royal marriage date was set and below follows a true account of their wedding day. Royal scrolls were sent to all the royal guests to attend in their finest garb On the 26th July in the year of our Lord nineteen hundred and ninety nine. 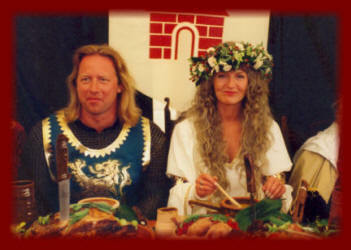 Princess Valaria & Sir Andy (Valerie Rowe Hartley and Andrew Hartley) Celebrated their medieval wedding reception in true medieval style. 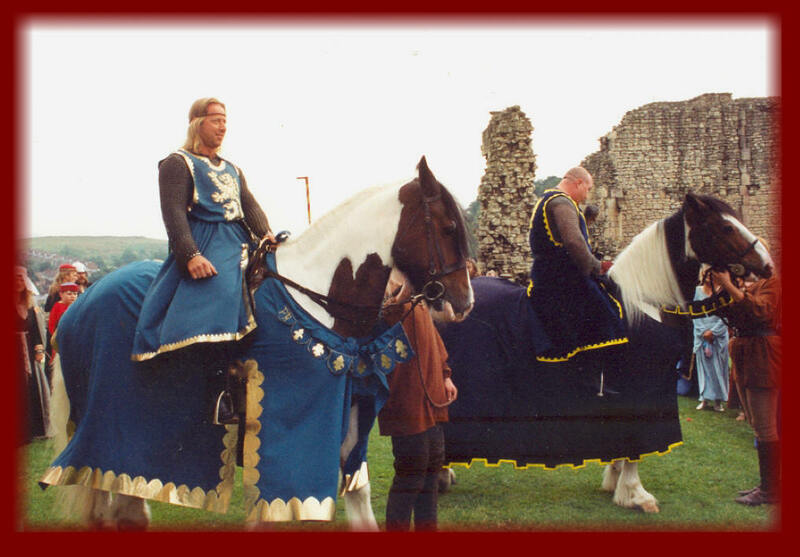 Sir Andy arrived on his mighty horse seventeen hands high adorned in chain maile for all to see and dressed in his heraldic colours of a gold lion symbol. As he rode up he demanded passage to claim the hand of his bride to be Valaria. 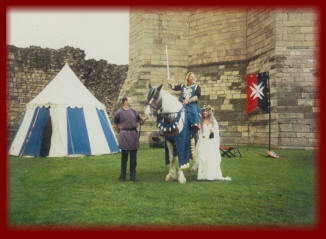 As Sir Andy rode into the castle Valaria’s breath was taken away with how magnificent he looked. Tears welled in her eyes as she realised this was their fairytale wedding day becoming a reality. 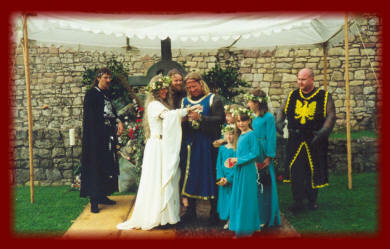 The Friar then joined them together as one beneath a canopy in front of a Celtic cross. 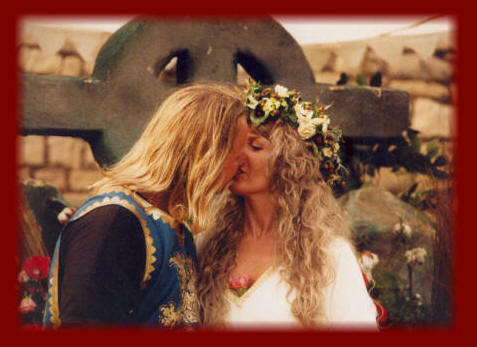 There they exchanged love knots and drank from a goblet and declared undying love for each other. 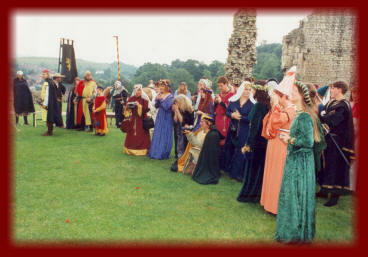 This is a true account of Princess Valaria and Sir Andy’s medieval wedding day. 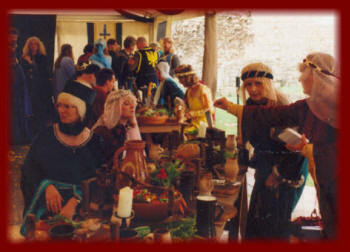 The most important day of their life - we hope you enjoy looking at examples of some of the many medieval weddings The Kingdom of Fantaysia has organised and are now presented to you in our wedding portfolio.